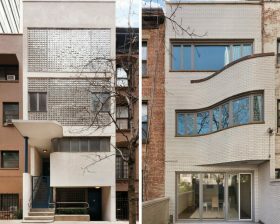 New York City’s first modern residence, designed by architect William Lescaze, has hit the market for $4.95 million. Swiss-born New Yorker, Lecaze is credited with pioneering the modernism movement in the United States, beginning with a townhome he designed for himself in 1934. Known as the William Lescaze House, the four-story home at 211 East 48th Street served as the architect’s personal home and studio. The now-landmarked townhouse was totally restored by Sage Realty, who “painstakingly renovated” the street facade to match its original condition.